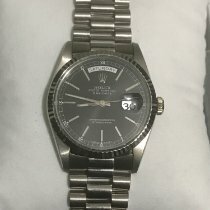 Extremely rare Rolex 18239 double quick set white gold day date president with Original Green Omani Khanjar black dial. This is an extremely rare version of the Omani Khanjar since it is in Green with Black dial. All original. Excellent condition!!! Recently serviced.